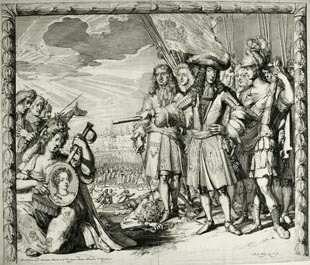 This contemporary Dutch engraving shows a triumphant William of Orange (1650-1702) arriving in England and symbolically crushing popery under foot. Above his head is a banner carrying William's famous quote that "the liberties of England and the Protestant religion I will maintain". It was engraved by Romeyn de Hooghe, a political iconographer closely associated with the House of Orange, and was published in Amsterdam by Carel Allard.